THE ADVANCED TRAINING CENTRE FOR COFFEE SPECIALISTS. Nowadays, all coffee bars are a dynamic company faced with fierce competitors and the constantly evolving tastes of consumers. A quality and skilled service are a starting point for success and are the result of the knowledge of products and of their preparation, of marketing concepts and careful management. In order to meet the need of Bar Professionals to keep up-to-date, Altascuola Coffee Training has developed a complete and advanced system of training and refresher courses, both theoretical and practical, focused on the most topical issues of professional qualification, also with a view to ensuring business results. The system comprises: IIAC courses (International Institute of Coffee Tasters), SCA courses (Specialty Coffee Association), in-house technical and practical courses and on-site training initiatives. Altascuola Coffee Training ensures the highest quality education and teaching, thanks to Qualified Teachers and Trainers and in-house Educators. At the end of the courses, Altascuola Coffee Training issues Certificates of participation acknowledged by the prestigious associations it collaborates with. 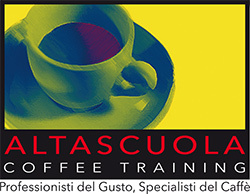 ALTASCUOLA COFFEE TRAINING is a leading training centre in the world of coffee.